With our first two stage Slaughterpit just around the corner, we decided we wanted to make sure you were all a bit more familiar with the seven fantastic acts we’ve got lined up for the event. Every band was picked specifically to offer a different interpretation of what is heaviest on the UK underground. There will be no light relief. If there are any artists on this list you don’t already know, we urge to get stuck into our Slaughterpit 2017 in 7 videos list below. Fans of heavy music are sure to find something here they don’t want to miss live. Some you might not get to catch up close and personal for much longer. Birmingham – These former Nuclear Blast Records artists fire out old school death metal with some major thrash twists. With album number four rumoured for a 2017 release, their last opus, ‘We Die As One’, was termed by Planetmosh as possessing “the majesty of Emperor,the ferocity of Napalm Death and the crunch of early Entombed”. Sounds like a neck-wrecking combo to us! Coventry – Bloodstock, Mammothfest, Beermageddon, and now this black-death metal troupe bring their “gentlemanly façade” and “theatrical madness” to the inaugural Slaughterpit. While they’re currently peddling upcoming E.P. ‘The Great Reclamation’, we went for something a little older. This one is taken from their 2015 album, ‘A Monster In Mourning’. Wellingsborough – Formed from the remnants of Gutworm and Deadeye, this lot have been churning up a furrow of tech-death fury since the release of 2015’s ‘A War Of Souls And Desires’. Their incredible energy and live presence has taken them to some amazing events, and if the initial impact of second album ‘Peace In Our Time’ is anything to go by, this train doesn’t look like stopping any time soon. Glasgow – About to drop their new ‘Era Of Corruption’ EP, Glasgow’s Blood Thread have been marching relentlessly across the metal-scape. With jaunts around Scotland and Ireland, radio spots on Toprock, Cranium Titanium, and Hard Rock Hell, and Moshville Times already giving ‘Era…’ a massive thumbs up, Blood Thread seem to be on an all out mission to take things to a new level. Glasgow – It’s possible that never before have just two men made such an ungodly racket as is achieved by Slow Walkers. This is totally chaotic noise, with a big slice of doomy, sludgy metal thrown into the mix. Heavy on the strobes and light on the melody, this is one little piece of insanity we just had to grab hold of when the option came up, and adds yet another angle to the heavy-as-hell approach to Slaughterpit. Perth – Experienced hands on the Scottish metal scene, these death-thrash-sludge veterans have returned to action, after a long, involuntary hiatus. Their 50% brand new line-up of old friends now includes past members of Nerrus Kor and Aorta/Scud. As they are yet to release anything under this formation, here’s ‘Nights Of The Old Code’ from their 2011 debut full-length, ‘The Scorpion Ensemble’. 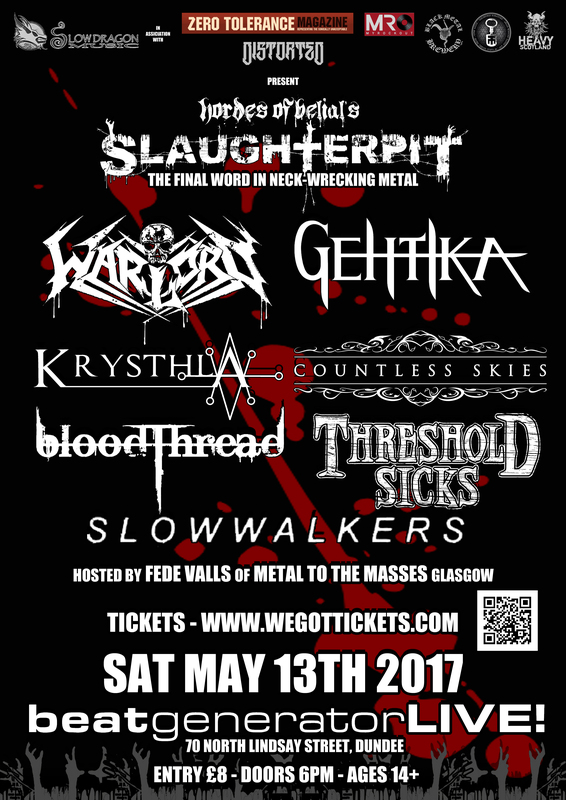 Posted in Latest News and tagged Blood Thread, Countless Skies, Gehtika, Hordes Of Belial, Krysthla, Slaughterpit, Slow Walkers, Threshold Sicks, Warlord UK.